Do you hate driving in the city? Do you fly into a rage when you can’t find a parking spot after spending hours in heavy traffic on the way to your destination? Do you have trouble deciphering satnav directions while paying attention to your surroundings? Or do you get easily distracted while driving and become a safety threat to all around you? Does the fact that your car can’t predict the future rustle your jimmies? Audi, along with US universities, has been studying just such problems. The gang provided a peek at their findings and solutions at the recently concluded GPU Technology Conference 2013 show in San Jose, California. The first finding is that more than 80 per cent of America's population lives in some sort of urbanised area – a 12 per cent increase over the last decade or so. City driving has become more difficult, and most accidents happen in cities – although, in the US at least, rural accidents account for most fatalities. Audi also found that driver frustration and distraction play a large role in both urban and rural accidents. The car maker pored over accident statistics in twelve categories such as “forward into decelerating object”, “road depart right/left”, “sideswipe left/right”, etc. These findings and others shaped the solution: a combo of hardware and software called the “Audi Urban Intelligent Assist”. The guys from the Audi HQ in Ingolstadt, Germany, did a good job of laying out their vision for future Audi drivers. It starts, modestly enough, by giving Audi vehicles the ability to predict the future. They’ll also personalise cars for individual drivers, improve controls, and provide systems that give more and better automated assistance. These are great goals, but what do they really mean when the rubber meets the road? 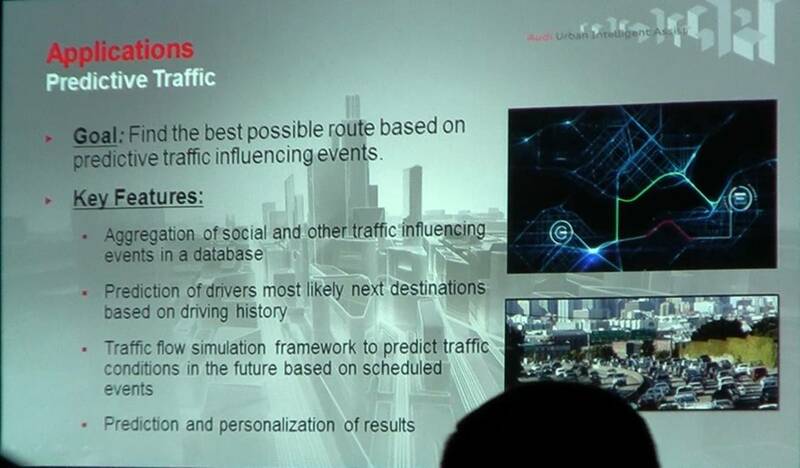 Audi’s Predictive Traffic feature attempts to find the very best route based on past traffic records, current conditions, and what it can glean about the future. Is there going to be a football game this evening? If so, your Audi will direct you to a bypass, thus avoiding the stadium on your way home from work. While you’re trying to negotiate multiple freeway entrances and exits, and jousting for lane position, sensors around the car track objects in a full 360-degree field. When you want to change lanes, you’ll be able to see the blind spot lurkers before you sideswipe them. Audi also realises that most destinations will not allow you to drive your car inside the building and park. So instead of just guiding you to an address, the car will give you a selection of currently available parking spots. (This assumes that the city you’re navigating has smart meters, and allows third parties to see their status.) 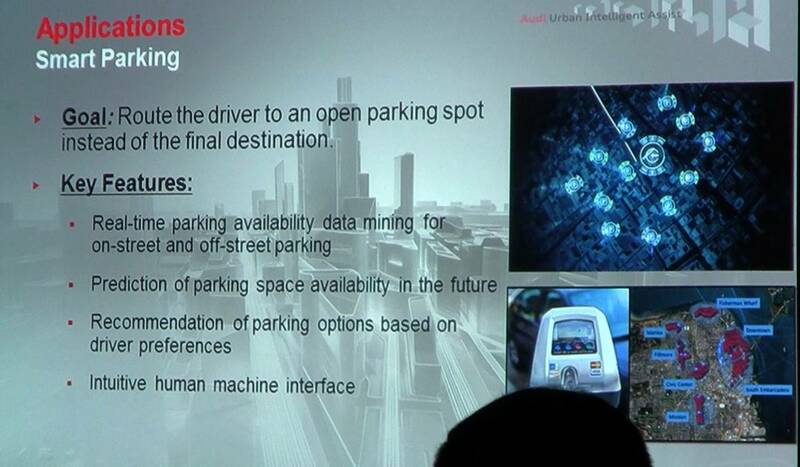 It will deliver prophecies about future parking availability using its predictive capabilities. The Smart Parking feature will also show you how much each parking option costs, allowing you to figure out whether walking an extra seven blocks is worth a $5 savings. Once you’ve parked, and emerged from a dank garage onto a street you’ve never heard of in an unfamiliar city, you need to walk to your ultimate destination – but which way is it? 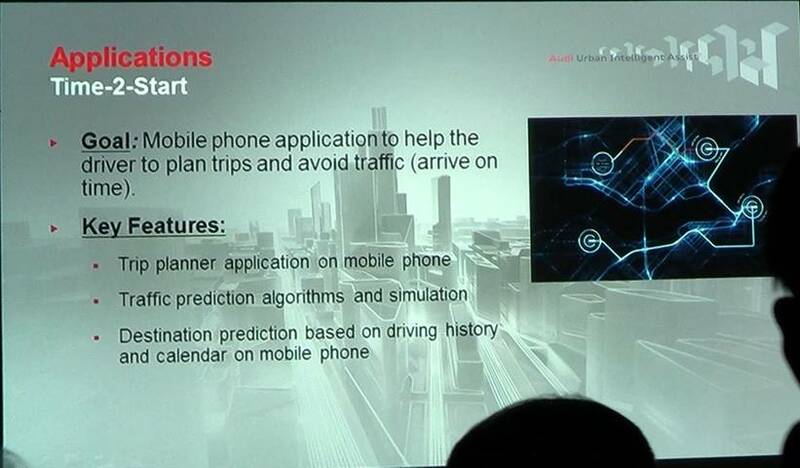 Another Audi solution called Seamless Navigation will wirelessly transmit the rest of your route to your pocket phone with step-by-step directions. When drivers don’t pay attention to the road for protracted periods of time, bad things happen. To combat this, Audi came up with Drive Attention Guard. It’s based on a set of cameras that track drivers’ eyes and head movements to determine where they’re looking. If the system sees that a driver is looking anywhere but straight ahead for some period of time (probably more than 10 seconds, but less than 10 minutes), it will take a series of steps to fix the situation. These steps can include engaging the adaptive cruise control in order to maintain distance from the vehicle ahead and also prevent the driver from unintentionally speeding up. It will also send signals to alert the driver that their attention has wandered. Audi was a little vague about what these signals will be. I would expect some flashing lights and various alert sounds. However, there’s no reason that a mild to moderate electric shock can’t be delivered through the steering wheel to drivers who don’t get the message. All of this technology is closer than we might think. 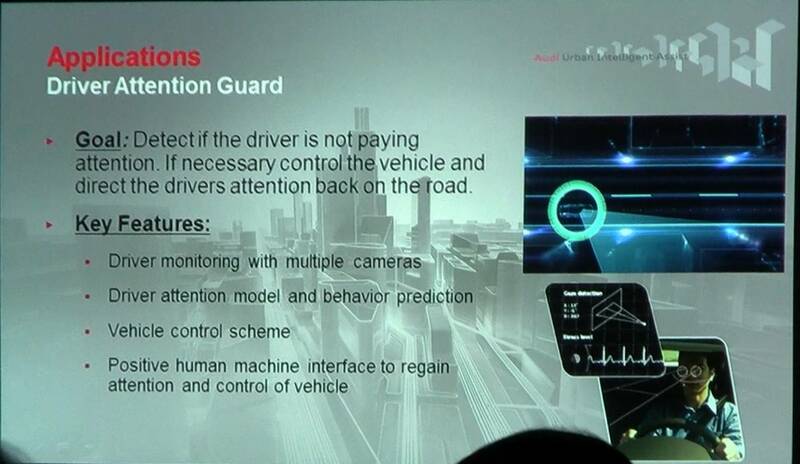 According to Audi, its engineers are testing these features in San Francisco and will hold public demonstrations throughout 2013. They left the impression that these smarty features will be added onto production models soon thereafter. One question occurred to me: where is all of this data going, and how is it going to be used? A system like this could build an incredibly detailed record of where you drive and your level of craziness – not just your speed but also how often you change lanes, how closely you’re cutting in front of other cars, and even how fast you take corners. I’m sure that motor insurance companies would love to have this info in order to justify insurance rates. Would they be able to buy access to this data? Or will we see more insurance companies offering rate discounts for drivers who freely give up access to their databases? And who owns this information, you or the service provider?